Proceeding through the one of the new Olmsted locks. Other lock and dam construction to the right. The anchor came up really clean this morning. Must be sand instead of mud. Only a mile until we turned left up the Ohio River. Today was our first overcast day since Alton, in the 70’s, but no rain. Two other trawlers, Dolinger and Special Edition, passed by just before we left. They traveled faster than we do, but they were waiting at each of the three locks we hit today. The Olmsted lock and dam are still under construction. 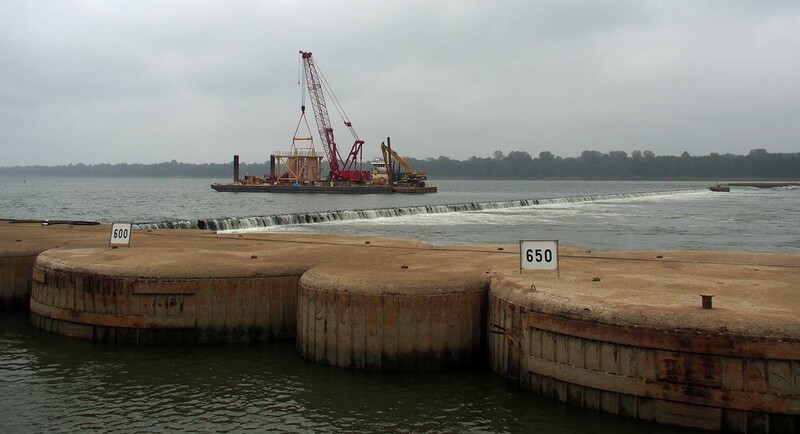 The dam is not complete and is not blocking water flow, but except for one of the very large new lock chambers passage is blocked by the construction. Its gates stay open and everything going either way has to go through it. No passing in the lock or its approaches. We still had to wait half an hour until we were directed through. Lock 53. Only a foot or two of rise. A few weeks ago this lock did not operate. Boats just went through at the dam. Olmsted called ahead to lock 53 a mile up. There we waited just a few minutes while a tow exited and we went in for just a few feet rise. Lock 52 was 23 miles further upstream. This is the one everyone talks about. Both 53 and 52 will be removed when Olmstead is complete. They were built in the early 1900’s and can’t handle the traffic now. One of the two chambers of lock 52 being repaired has made for tremendous backups, but fortunately both chambers have been operating for the last few days. We arrived at lock 52 to find the other two boats waiting. It was an easy wait as we all just drifted with engines off in a very slow current below the dam. The Ohio here is very wide. The lockmaster had assigned a radio channel for us to monitor for instructions. After another hour we were called into the small lock at the same time as a large down bound tow came into the large chamber beside us. The most commercial traffic we have seen has been on the Ohio. Here tugs push barges into tie up positions. We were out a little after 3 PM. 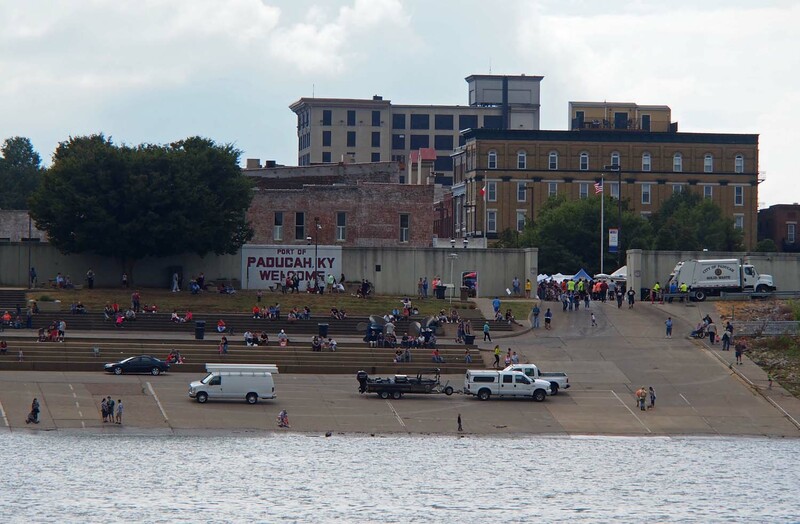 The other two boats took off and ended up going up the Tennessee River while we continued up the Ohio another ten miles to our anchorage, just a few miles short of the entrance to the Cumberland River. We are a few thousand feet up a small branch of the Ohio that runs behind Towhead Island. We dropped anchor in the middle of a 1000 x 500 foot rectangle we drove around in to tests the depths. Large towboats waiting for their next job. Crickets are the only thing we hear. We can look down the end of the channel and see tows passing by. Fifty eight miles on the Ohio on a decent weather Saturday and for the first time in three days we actually saw two rowboat sized boats with people fishing! Nothing else though. Looks like we might get back into recreational boating areas. Welcome? 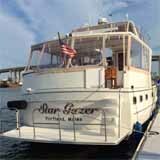 Tie a few rusty barges to the bank and we loopers would love to visit and spend a night or two. If not for modern technology we would think we are far from civilization, but like last night, Google maps tells me there is the small town of Smithland KY just 2½ miles NNE at the junction of the rivers.